362 people in our community are currently praying with you. Bocelli performs an ancient hymn, words by St. Augustine of Hippo. Holy Jesus, who has promised that if we love you, you and the Father will love us and come to us and make your home with us, I give you my love without reservation. Your words are sacred and I aspire to live by them, this day and always, and I glorify you for your sacrifice of pain and death, for no other reason than to give salvation and eternal life to me and to all who follow you. Pharaoh Notes the Importance of the Jewish People by James Tissot, ca. 1896. When life caves in, you do not need reasons, you need comfort. You do not need some answers, you need someone. And Jesus does not come to us with an explanation . . . He comes to us with His presence. So the taskmasters and the foremen of the people went out and said to the people, “Thus says Pharaoh, ‘I will not give you straw. Go and get your straw yourselves wherever you can find it, but your work will not be reduced in the least.’” So the people were scattered throughout all the land of Egypt to gather stubble for straw. Pharaoh is the prototypical jerk boss. He is a bully with complete power. How would we feel if we asked our boss, "Can I have three days off to attend my sister's wedding?" and he answered, "If you have so much idle time you can just take off for three days, you don't have enough to do," and then gives you additional work instead of the time off you'd requested. We'd start looking for another job — and this is just what God has planned. 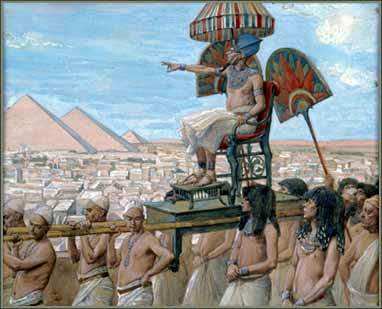 Of course, the stakes are higher for the Hebrews; they are slaves and Pharaoh has life-and-death power over them. 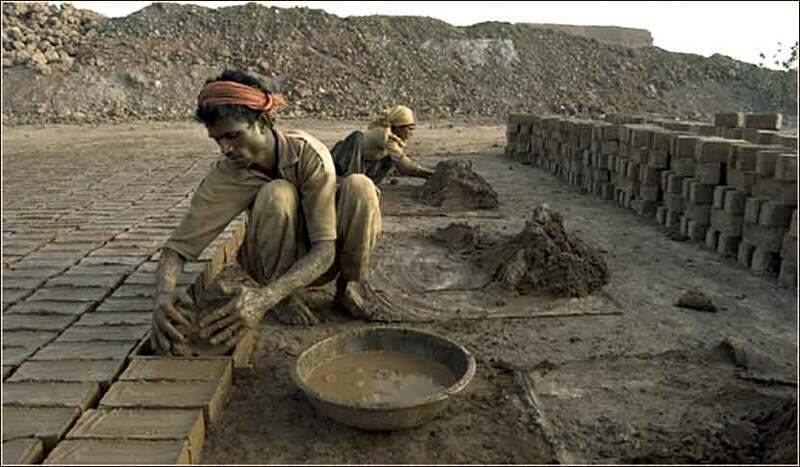 And most of us do not have jobs approaching the harshness of making mud bricks in the hot Egyptian sun, from dawn to dusk. But Pharaoh has not simply treated the Hebrews cruelly; he has also interfered with the worship of the one true God, the God of real power. The Hebrews are not asking for a long weekend in the Bahamas, but rather, time to make obeisance to the Lord. Pharaoh certainly mistreats the Hebrews; but he makes an even greater mistake by effectively preventing God from being worshipped. Pharaoh asks "Who is Yahweh", meaning two things. First, he simply doesn't know who God is. But more, it is a statement of disdain: Who does this "Yahweh" think he is, to give orders to the Pharaoh of Egypt? He then refuses to use the name again, paraphrasing their request as "let us go and sacrifice to our god" as if Yahweh is just another half-man, half-beast statute. Pharaoh's concept of a god does not give him the background even to understand what Moses and Aaron are saying.He thinks that they are, essentially, lying. Like every nonbeliever, then as now, God's Word is just a bunch of nonsense that impedes his ability to set his own terms for life, a silly morality invented by someone else to impede his creative power and interfere with his enjoyment of life.